Introducing Candice Phee: twelve years old, hilariously honest and a little... odd. But she has a big heart, the very best of intentions and an unwavering determination to ensure everyone is happy. So she sets about trying to 'fix' all the problems of all the people [and pets] in her life. I have never read a book like this one- the concept really appealed to me. Candice Phee has been set an assignment to write an alphabet autobiography- and that is exactly how the whole book is set out. Letter by letter, almost like a jigsaw puzzle coming together, the reader can delve deeper in her life- and discover the cracks in the foundations of her family. Her family has experienced tragedy, and has become quite dysfunctional, and it is clear that Candice isn't like other normal children. There was not a character that I didn't warm to straight away- they all give younger teenage readers a lesson that actually, families are not always perfect, and bullies have their own personal lives that you would not know what it is like. But they also tell the readers that even though families and friends may have disputes: the love is never broken. Candice and Douglas were my personal favourite characters, as they show that you don't have to be like everybody else, and follow the crowd- it is much better to be your own person. Jonsberg writes in such a vivid way that it had me captivated; he made Candice's voice predominate throughout each page, never wavering at all. The whole book was written in such an innocent, beautiful mindset- it just made me so happy. 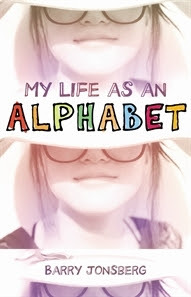 'My Life as an Alphabet,' is a definite 5/5. You cannot go wrong with this book, especially for young teenagers who are just starting to figure out the way to young adult life. I haven't heard of this one before, but it sounds really cute!